Blowout Sale! 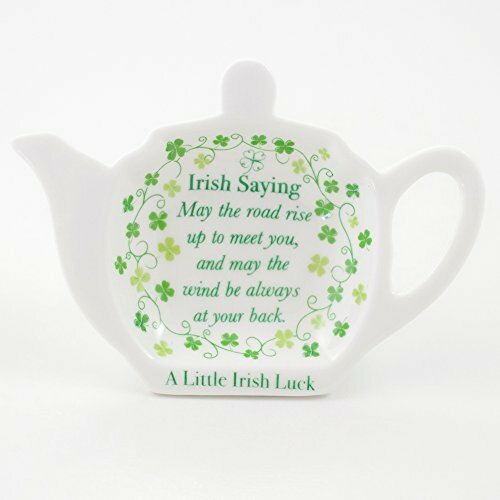 Save 55% on the Tea Bag Holder, Clover Irish Saying by Carrolls Irish Gifts at Jakis Cafe. MPN: 01130. Hurry! Limited time offer. Offer valid only while supplies last. They say that in an Irish home the kettle is always on. A cup of tea is offered upon the arrival of any guest and insisted upon before any departure. They say that in an Irish home the kettle is always on. A cup of tea is offered upon the arrival of any guest and insisted upon before any departure. Therefore Irish homes must have all the right accessories. This tea bag holder comes in an adorable teapot shape. It is ideal for holding teabags as they cool down and dry before being disposed of while keeping your countertops empty of clutters and dreaded tea stains. This teabag holder comes in white to compliment your kitchen decor. It features an authentic Irish Saying which brings the owner good luck. It is an ideal reminder of the Emerald Isle that can be used every day.